According to a 2015 survey conducted by Harris Poll, 95 percent of pet owners consider their animals members of the family, with many devoting a considerable amount of effort to pampering their pets. In fact, 45 percent of pet owners polled said they occasionally or frequently bought their pets birthday gifts. But some of the greatest gifts we can give our pets are safe play areas and plenty of attention. Providing those necessities will go a long way toward making you a good animal owner who not only keeps the people and pets in their own home happy, but maintains a positive relationship with neighbors, friends, and other creatures who may come in contact with your pet. While keeping your pet on your own property isn’t a pressing problem for animal lovers who own birds, gerbils, or other caged critters, the same can’t be said for dog owners. So, whether you are moving to a new neighborhood, getting a canine companion for the first time, or upgrading your property to better suit you and your furry friend’s needs, here are some things to consider to keep everyone happy — including your neighbors. A fenced yard will give your pup a place to play and reduce the odds of unannounced visits to other’s private property. Your ideal option will depend on factors including your climate and the primary purpose for installing the fence, according to Better Homes and Gardens. For example, a fully enclosed wooden fence might be a good choice if you’re looking for an option that blocks noise and wind while providing privacy and keeping pets and kids safe in the yard. According to HomeAdvisor, having a wood fence installed costs an average of $2,008 to $4,682 in the Dallas area and should take about three or four days. But, before you schedule an installation, you should share any plans to add fencing to your property with neighbors who will be affected. Those with a fully fenced yard may think the next logical step is installing a doggy door. And while the convenience that comes with allowing your canine companion to let himself in and out can be tempting, you might want to think twice before buying one. For instance, some pet doors can provide access to outdoor critters such as raccoons and squirrels, which could also become a nuisance to neighbors if they start invading homes and trash cans. And, ideally, you’ll be outside with your dog frequently, which will help keep her happy and healthy and allow you to get some exercise, too. 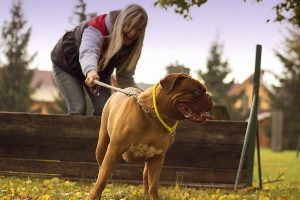 In addition to romps around the yard, consider taking her on walks frequently and making visits to a local dog park to provide her with a variety of places to play. Paying plenty of attention to your pet will also help reduce barking and other undesirable behavior that may annoy you and your neighbors when your dog is in your yard. Finally, even if your dog is well watched and exercises often, there’s always a chance he could escape in search of more adventure. Or another animal could find its way onto your property. So you should make sure your dog’s vaccinations are up to date. And, unless you have specific plans to breed your dog, he or she should be neutered or spayed because it helps keep animals healthier and reduces the problem of pet overpopulation. Dogs that have been spayed or neutered tend to also be better behaved, which will carry over into how they act on walks around the neighborhood and visits to the dog park. If you give your dog plenty of love and attention and a suitable space to stretch his legs, chances are he’ll be more than happy in his own yard, making him a neighborhood favorite and you a conscientious canine owner.